Item is a small, flat, hand-held camera with black plastic body and brushed metal, gold-coloured front plate. 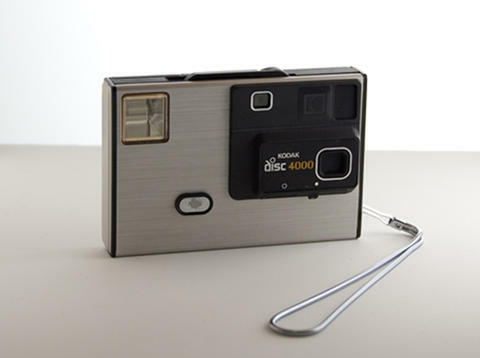 Intended by Kodak to replace their instamatic line of cameras, the Kodak Disc cameras were designed to be simple to use, with all automatic functions. The camera used Disc film, a proprietary format that made 15, 11 x 8 mm exposures; this small negative size made the resulting prints very grainy when enlarged and, while the camera did well when it was first introduced, it lost populatiry due to the low quality prints it produced. Item includes a built in flash and wrist strap.